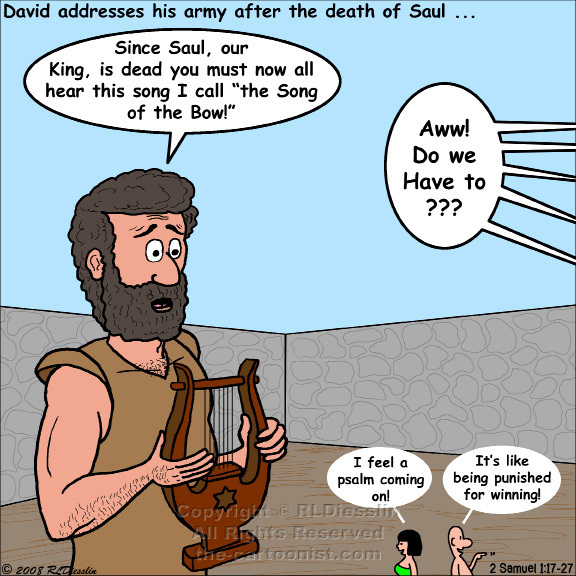 1 After the death of Saul, when David had returned from defeating the Amalekites, David remained two days in Ziklag. [...] 17 David intoned this lamentation over Saul and his son Jonathan. 18 (He ordered that The Song of the Bow be taught to the people of Judah; it is written in the Book of Jashar.) He said: 19 Your glory, O Israel, lies slain upon your high places! How the mighty have fallen! 20 Tell it not in Gath, proclaim it not in the streets of Ashkelon; or the daughters of the Philistines will rejoice, the daughters of the uncircumcised will exult. 21 You mountains of Gilboa, let there be no dew or rain upon you, nor bounteous fields! For there the shield of the mighty was defiled, the shield of Saul, anointed with oil no more. 22 From the blood of the slain, from the fat of the mighty, the bow of Jonathan did not turn back, nor the sword of Saul return empty. 23 Saul and Jonathan, beloved and lovely! In life and in death they were not divided; they were swifter than eagles, they were stronger than lions. 24 O daughters of Israel, weep over Saul, who clothed you with crimson, in luxury, who put ornaments of gold on your apparel. 25 How the mighty have fallen in the midst of the battle! Jonathan lies slain upon your high places. 26 I am distressed for you, my brother Jonathan; greatly beloved were you to me; your love to me was wonderful, passing the love of women. 27 How the mighty have fallen, and the weapons of war perished! We skip over the huge drama that plays out between David and Saul and move to Saul's death and David's tribute to Saul and son, and David's dear friend, Jonathan. The bow was Jonathan's weapon of choice (the sword was Saul's) so even though it is a tribute to king Saul, it may be more in honor of Jonathan. The Philistines, who Saul was battling at the time of his death, remain a strong military threat to the region.